It's always disheartening when an artist you like decides to go down a musical path you don't. Not mentioning any names, but like when a pop star with decades of hits experiments with country music, for example. This week in 1993, a singer who found fame singing pop-dance anthems returned to the sound that had established her on the charts after a detour into MOR pop/rock territory. Meanwhile, at number 1 this week in 1993 was "Informer" by Snow. The reggae hit spent its second week on top. In the US, this lead single from The Chronic had given both rappers their first major hit, peaking at number 2, but the influential hip-hop track flew under the radar locally. The Stefan Dennis of E Street (which has just been axed). While his cast-mates were having hits, B-Man Samazan bombed out big time with his attempt at rap. Emphasis on "attempt". Two things worked against this cover of the Lou Reed classic being a hit. 1) The song had been taken into the top 30 in 1990 by Jamie J Morgan. 2) It's by Jimeoin. As Jeremy Jordan moved closer to his chart peak with "The Right Kind Of Love", a second single from the Beverly Hills, 90210 soundtrack joined it on the top 50. A big ballad from the dream team of songwriter Diane Warren and producer David Foster, "Saving Forever For You" showed a more mature side of the then-20-year-old singer known for the perky pop of "I Love Your Smile". Keep an eye out for 90210 star Brian Austin Green channeling his on-screen character, school DJ David Silver, in the music video. I'd never been very happy about dance diva Taylor Dayne's move into more of an adult contemporary pop/rock direction on 1989's Can't Fight Fate, especially the decision to release "I'll Be Your Shelter" and "Heart Of Stone" as the album's third and fourth singles. Cut to 1993, and all was forgiven when she kicked off her third album, Soul Dancing, with this rousing remake of Barry White's "Can't Get Enough Of Your Love, Babe" from 1974. Produced by Clivillés & Cole, Taylor's version was a last-minute addition to the album at the behest of Arista bigwig Clive Davis, who correctly recognised that intended single "I'll Wait" just wasn't up to scratch - an appraisal that proved correct when it was released in two singles' time. 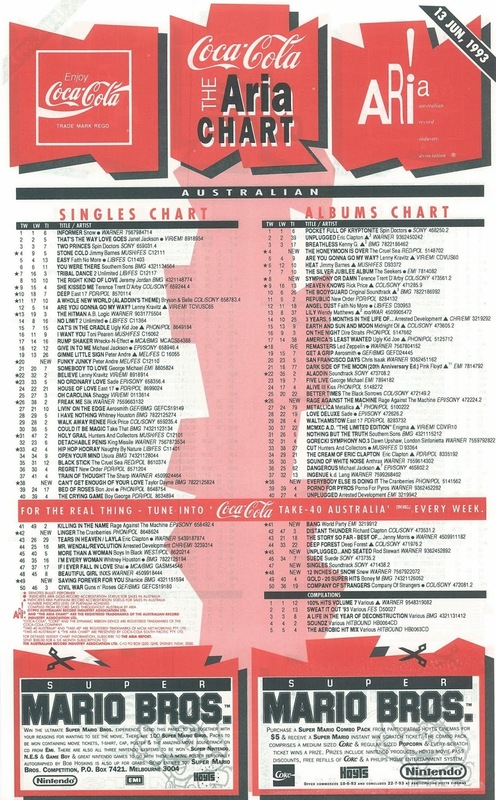 Putting her firmly back in pop-dance mode, the cover eclipsed everything she'd previously released by climbing to number 2 for three weeks on the ARIA chart, kept from the top by UB40. 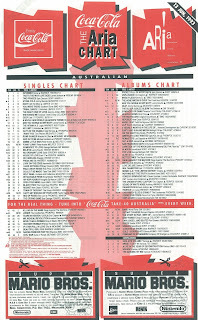 My recent posts covering the "final' printed ARIA chart from 1998 featured an appearance by Peter Andre's last top 50 single, "All Night, All Right". Five years earlier, the 20-year-old was up to his second hit, which stormed straight into the top 20 accompanied by a music video in which Peter wore marginally more clothes than in the clip for "Gimme Little Sign". Unlike that breakthrough hit, which marked half a year on the chart one spot higher at number 19, "Funky Junky" was an original song (instead of a remake) and one that Peter actually co-wrote. Produced by Ashley Cadell, who'd been behind some of Kate Ceberano's best songs, the sound was an adequate blend of '70s-style funk and modern R&B, but Peter's nasal vocal style pushed it over the edge of irritating for me. Next week: the reggae onslaught continues with a massive remake from a band that knew a thing or two about cover versions. Plus, one of the year's quirkiest (i.e. most annoying) songs. Pretty sure I haven't heard 'Nuthin' But a 'G' Thang' before, despite it appearing for weeks on the US top 50 as announced on Video Smash Hits (though with no musical excerpt). I've got a better quality copy of the Bruce Samazan video, but don't think I could bring myself to upload it to YouTube... I haven't heard the 'song' since then. Rap just doesn't work with an Australian accent IMO; not that this is really 'rap'. The Shanice track took a while to take off, first released locally in late January '93. Shanice reminds me of the Cat in the Hat with that hat she wears in the video. Pleasant though it may be, 'Linger' was just the kind of song to make me struggle staying awake, watching the top 60 on rage live in the early hours of a Saturday morning. I liked Taylor's rendition of 'Can't Get Enough...' at the time, but I don't care for it that much now. I much prefer 'I'll Wait', though the UK single version (which we also got, I think) is bad. The LP version, used in the video you've embedded, I like. Rhyming funky with 'junky' for a t(w)een-oriented artist was a questionable move. I didn't mind Taylor Dayne's pop sound, but "I'll Be Your Shelter" is the only song I like by her. Only in small doses, mind you. "Can't Fight Deafness" as one Smash Hits letter-writer put it. The only place I ever saw the video (set in a supermarket for some reason) for "Walk On The Wild Side" by Jimeoin was on The Afternoon Show. I remember Michael Tunn did an interview with him beforehand and specifically got him to pronounce the worlds "woiyld soiyde". "When Peter Andre released "Funky Junky", his current wife was almost 4 years old…"
Wow, that is shocking, and makes me feel so old.